I’m as Corny as Massachusetts in August…. The Augusts of my childhood in Hawley, Massachusetts, were golden, both literally and figuratively. 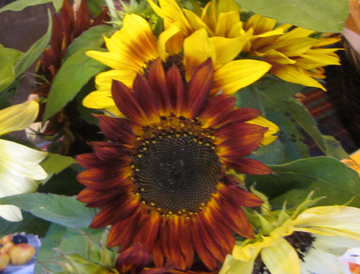 The landscape was filled with the bright yellow of sunflowers and the duller yellow of hay. The sun seemed to shine every day as we swam and swam and swam. And corn was consumed every single evening—just before all the neighborhood children rushed from the dinner table to engage in a spirited game of Kick the Can. I loved corn then. I still do. The act of eating it takes a certain amount of deliberation. With its lovely long rows of kernels, this vegetable stretches on like a perfect summer day or evening. The freshest corn (and of course we ate and eat only the freshest) is sweet and not starchy, purchased the day of its picking at the farm on which it grew. Most of the time I still serve corn as I my mother did when I was young. I quickly boil or grill it and add butter, salt, and pepper. I’m a lot less lavish with the butter than I was as a child, of course; in fact, sometimes I omit it altogether. Once in a while I feel the urge to get go beyond straight corn, particularly with leftover kernels. My mother’s favorite use for leftover corn is in succotash. She loves to combine it with cranberry beans (those whitish beans with pink stripes that appear in farm stands and stores only at this time of year). As soon as I find some cranberry beans, I’ll post her recipe. Meanwhile, here is one of my current favorite ways to use leftover corn kernels. It combines the corn with another iconic August food, the tomato. However I eat it, the texture and flavor of corn always take me back to those August days and nights of my childhood when time stood still, children played and laughed, and the landscape glimmered with yellow. This post is my own contribution to the Loving Local Blogathon, taking place from August 22 to 28 as part of Massachusetts Farmers’ Market Week. Core and chop the tomatoes. Using a slotted spoon, move them into a medium bowl. Discard the remaining juice or use it in soup. 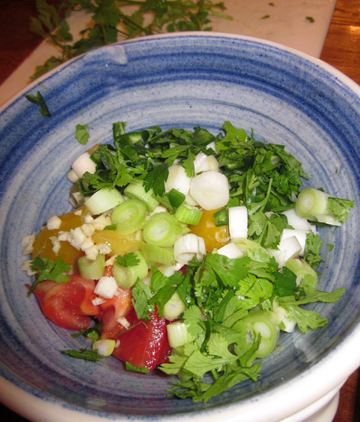 To the bowl add the peppers, onion, garlic, and cilantro. Stir in the lime juice and salt. Allow the salsa to sit at least 1/2 hour so the flavors can meld. In a bowl thoroughly combine the flour, the baking powder, the salt, the pepper, the cumin, and the cheese. Whisk together the milk, the oil, and the egg. Add the herbs if you are using them. Stir this liquid into the flour mixture. (A few lumps are just fine.) Stir in the corn. 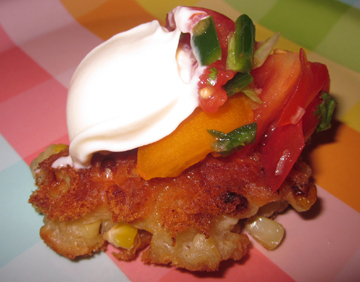 Top each fritter with a spoonful of salsa and a dollop of sour cream or crème fraîche. This entry was posted on Thursday, August 26th, 2010 at 10:10 am	and is filed under Appetizers, Loving Local Blogathon, Vegetables. You can follow any responses to this entry through the RSS 2.0 feed. You can leave a response, or trackback from your own site. I am salivating for these fritters and salsa. Also love your fun loving blog header. Too cute! 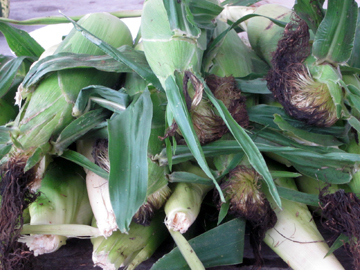 Mmmmmm, nothing tastes like childhood summers more than fresh corn! This looks absolutely delicious. I love the photo too. Nicely written. I miss fresh corn. Jonathan, I wish I could send you some. Kathleen, I couldn’t agree with you more (obviously!). Thank you, E. And welcome, Layanee. Tinky-this sounds absolutely delicious! I’m a fritter fan of all kinds! Yum!